Hey, you. Did you catch the rumor about Barack Obama? Psst. Yeah, you buddy. Guess what I heard about the junior Senator from Illinois? Did you know he might have once been...a Muslim? And dig this, he may - only may, I stress - have once received "training" in Islam while a child in Indonesia? Yeah, it's what they're saying. It's out there. Despite his denials, rumors and e-mails circulating on the Internet continue to allege that Obama (D-Ill.) is a Muslim, a "Muslim plant" in a conspiracy against America, and that, if elected president, he would take the oath of office using a Koran, rather than a Bible, as did Rep. Keith Ellison (D-Minn.), the only Muslim in Congress, when he was sworn in earlier this year. I guess we should be grateful that the paper allowed Obama to "dispute" and "deny" the "charge" but considering that he isn't a Muslim, it might have been a teensy bit more responsible if they'd simply written that it's a lie and let it go at that. Instead, it blandly suggests this will hurt him more than the Romney since the polls show that even more people won't vote for a Muslim than a Mormon --- failing to note that Romney is actually a Mormon and thus could be expected to suffer from these prejudices more than someone who isn't actually a Muslim! Then again, I didn't think the anti-Mormon whispers about Romney were fair either. More from Huffington Post, TPM, Carpetbagger, Kos, and Taylor. "I chanced to go through Elysian Fields during the progress of a contest between the noted Eagle and Gotham Clubs. The game was being sharply played on both sides, and I watched it with deeper interest that any previous ball match between clubs I had seen. It was not long before I was struck with the idea that base ball was just the game for a national sport for Americans." This account the game's evolution toward professional status has always been a more credible story than the Abner Doubleday "founding" myth from 1876, which had the former Union general from New York formally inventing our pastime. Silly, but then again the Doubleday heirs did own half of the New York Mets until the Wilpons bought them out, so perhaps silly is as silly does. As I rode the ferry to lower Manhattan (and what a fine afternoon for the ride), it seemed to me that the Mets' story during this long, dark off-season is even less compelling than Abner's mythical founding. The news from Shea is as dreary as this time of year, while in the Bronx the second generation Steinbrenner has resigned A-Rod, and Posada, and Rivera and is in keen pursuit of Johann Santana. The Mets? The big Yorvit Torrealba-Johnny Estrada dance for platoon catcher is all the waltzing we've seen in Queens. The Mets are moving to also-rans in a division they gave away two months ago, falling behind the Phillies - from Philadelphia, for heaven's sake! Outside of the core Wright-Reyes-Beltran ring of gold, this team is notable for what it lacks, for the gaping holes in its pitching staff. Tom Glavine is back in Atlanta (and good riddance on the lackluster lefty) and the coming stars (the Humbers and the Pelfreys) haven't panned out. Pedro and El Duque are older than Brooke Astor (combined) but more injury-plagued (the grand dame still clocked in the high 80s on the philanthropy gun when she checked out, and hadn't missed a gala start in 82 consecutive seasons), and that leaves two terrific three-four type starters in John Maine and Oliver Perez. The pen, of course, is much worse -it cost the Mets the division title and needs an almost total overhaul. In the field, outside of the golden three, we've got age and production problems at first, injuries at second, and gimpy 74-year-old Moises Alou in left. Rightfield? Lastings Milledge perhaps, though he remains the team's greatest trade bait - itself a sad story when you're competing for Santana with the young, talent-hungry Twins. This is a thin year for free agent material and dangling trades of team-changing talent, it's true, but Omar Minaya can hardly use that as an excuse. He has to produce a high-quality team and fast, especially in this last year of Shea Stadium - a thought that depresses me almost as much as darkness at 4:30 in the afternoon. Sure, it's a massive pitted pile of concrete with narrow seats, bad sight lines, and a constant cold wind off of Flushing Bay. Still, I've spent so many pleasant afternoons pondering the deep green grass and Jerry Koosman's prodigious sweat glands, that the notion of the wrecking ball seems like an executioner's song for my baseball childhood. And then there's the new park. Another short journey last week put me on the train between the city and Great Neck, and I took a gander at the rising stadium. It grows quickly, and the upper deck seating is taking shape. Citigroup gets the name - to me, it's like spelling the great catcher's name Jeri Grote, but what do I know about brands - and can obviously afford a stadium while laying off up to 45,000 people in the next few months. Which is a hell of an irony because that's exactly how many people the new bandbox will hold! Maybe Citigroup can hold a fired employees day with free tickets as part of its severance package. The new place is small, and covered in brick. Fred Wilpon thinks of the stadium as a new Ebbetts Field, which was a whole borough over and far away. The rotunda, hard by the Flushing line, will be named for Jackie Robinson, who famously retired rather than play for the Giants. Those were the days - times that flashed briefly during the very early days of the Mets, when Yogi Berra caught and Duke Snider played centerfield. Gil Hodges played a little first base during his last playing days, and later managed the greatest squad in team history, just four years before another National League championship team was graced by the dotage of Willie Mays. The throwback impulse isn't necessarily a bad one, but the Mets need a perennial contender to pay for it - or they risk being a a kind of Gothamite Seatttle Mariners franchise: nice little team, gorgeous field, never wins it all. "...a fantastic farm where ashes grow like wheat ridges and hills and grotesque gardens, where ashes take the forms of houses and chimneys and rising smoke and finally, with a transcendent effort, of men who move dimly and already crumbling through powdery air." UPDATE: I should have worked this in higher up, but if you're looking for the best off-season baseball rumor site in the world, click here. 'Tis great. A lengthy and elegant mess of a film, Todd Haynes’ not-so-experimental I’m Not There is nonetheless a beauty of a wreck, a “non-biopic” about Bob Dylan that mainly ignores that facet of Dylan that always hides in plain site when analysts look for meaning in the minstrel poet’s own life - his music. Jason counters with his (more positive) review here. When I head to the office, I never know what to wear on any given weekday. In winter, the blue suit or the gray suit? The pinstripes or the, er, pinstripes. In summer, the navy or the olive green. Tie for clients, no tie for no clients. Weekends, which sweatshirt with those jeans? Hmm...what's the color this season? So okay, my personal fashion sense is somewhat limited - but that doesn't mean I don't admit fashion's role in popular culture, its thousands of years of history and vital importance, the strange, coltish nature of those darned models, and that weird cross-toe runway walk. 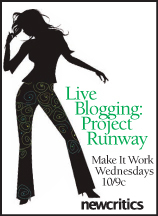 So who was I to object when newcritics bloggers Jennifer and Claire teamed up to go all live-bloggy on Bravo's popular Project Runway reality series, which began its fourth season last week? Why pass up the chance to caper "with cameo appearances by some of the nicest bloggers ever to caper in a catsuit in homage to Honey West," as Jim Wolcott put it. I'm up for vicious fashionista snark and the low, low necklines of pret a porter putdowns as much as the next guy! And what better way to follow on our Mad Men Thursday night blogfests - now in hiatus - then with Wednesday night fashionfests. So I'm on board, right there in the front row, looking up the ... I mean ... at the skirts, and dresses, and blouses and lingerie (yes, Lance, lingerie!) of the newcritics Project Runway live-blogging party. 1o EST, Bravo and newcritics.com. Of course, Musharraf is not the first leader whose rhetoric does not match his record, especially on fighting extremists. But, you see, the war on terror demands that today's rule of law and democracy be suspended in order to preserve the rule of law and democracy in the future (I'll bet you anything that Cheney is sitting back toasting Pervez with a glass of 30 year old Scotch every night after dinner). Musharraf is full of contradictions. During his rule the Pakistani press has opened up and more voices are being heard. At the same time he has cracked down on the press when it suits his interests. Now it seems that some of the outside pressures have pushed Musharraf to release 3,400 detained since martial law was imposed. Let's hope that he steps down before the scheduled elections and restores the constitutional government in Pakistan. The moderates are the only ones who can save Pakistan, and they have lost all faith in Musharraf. Ralph also reminded me that one of my personal heroes, Mukhtaran Bibi, faced up to Musharraf and his bullies. Perhaps she's the best symbol for the troubled nuclear nation. The best scenes are filmed in claustrophic spaces - the tiny shared office of newly-elected MPs Brown and Blair, the stifling and smokey train coaches to Scotland, the middle class kitchens and sitting rooms of the English, and the angular pubs and wine bars of London. This isn’t soaring politics; Frear only shows that in clever video clips. This is deal-making or, more accurately, a fine portrayal of the kind of personal compromise that is a necessary ingredient to attaining political power. Jim Wolcott has his take - and some commentary on British politics - here. My favorite couple of blocks in all of New York (from the existential perspective, I mean) has no doorways, no stoops, no storefronts, and barely any sidewalk to speak of. Indeed, by rights it shouldn't have a name. But it does. There was no famous denizen of Murray Hill named Tunnel Exit whom the City Council saw fit to honor with a sign. No legendary saloon keeper or actor or civil rights lion. Though as a name, come to think of it, Tunnel Exit has certain cinematic quality that I like. No, Tunnel Exit Street is the barren stretch of roadway running north between East 37th Street and East 41st Street. It begins outside the west-bound exit of the Queens Midtown Tunnel and is essentially a conduit between Second and Third Avenues with the sole purpose of diffusing rumbling trucks onto less-congested side streets rather than a single, already grid-locked avenue. There are no addresses on Tunnel Exit Street, yet there is a thin sidewalk on the east side and pedestrians - oh, say those making a quick trip to the Frontier Coffee Shop from the old News Building, just for argument's sake - often use it as a shortcut. And the city, in its wisdom, has seen the justice of placing formal green street signs on every corner. They hang there each day on their bleak couple of blocks where no mailman needs to tread, no delivery trucks pull up, and they speak their simple message with some strange, civic pride. Mister, every street in this town has a name even if it has no addresses. No dwellings. No places of business. And you, sir, are on Tunnel Exit Street. Pity the neocons. Their war against Islamofacism just drags on and on, the Bush Administration resembles the New York Jets running out the clock in the fourth quarter of yet another blow-out at the dreary Meadowlands, and the reports out of Iraq just don't hold the same manly drama they once did. So many have moved on. Neocon godfather Norman Podhoretz brings his must...bomb...Iran...now mantra to the campaign of Rudy Giuliani, who proclaims that "civilization itself" is in danger from Islamic fascists. Paul Wolfowitz grew bored with warfare early, ran the World Bank into the wall, and is hiding out at the American Enterprise Institute. Richard Perle apologized and disappeared into the think tanks. And talk about move on - Karl Rove is advising Democrats. But one famed neocon - the best writer of the bunch - has really let his snarling, gung-ho, kill 'em before they kill us war vision slip away, in favor of...cosmetic waxing?! Yes, Christopher Hitchens, the reformed liberal who became knee-shakingly fearful for western civilization after 9/11, has spent two full issues of Vanity Fair engrossed (le mot juste) in extreme personal grooming. While the fighting men he urged on (and mourned, I must say) continued to go door to door in the worst neighborhoods in the world, Hitch had an appointment at the studio of "the renowned 'J Sisters,' the seven girls from Brazil who have pioneered the waxing technique that bears their country’s name." What followed? I wonder. With the neocons otherwise occupied as the war drags on, what next for Rumsfeld? UPDATE: It's always so wonderful when they turn on themselves, isn't it? And this guy is touting the leading Democrat! I am well aware that opinion columnists in The Times are granted more leeway in their writing than reporters. Even so, tomorrow's Maureen Dowd column on the sexual roles of the major Democratic candidates for President is well beyond the pale for a family newspaper, and for any paper of national repute that claims to be a major voice of the republic. Her explicit and wholly imagined "account" of the sexual motivation behind how the candidates behaved in a televised debate brings nothing but shame to the Times, and betrays the newspaper's long-held responsibility for public discourse. Her two-bit "analysis" of a specific sexual fetish as the reason for the candidates' lively give-and-take during the CNN debate coarsened that discourse and the reputation of The New York Times. How can a paper like The Times continue to run these strange sexual imaginings week after week and refer to them as political coverage? What a disgrace. "Whichever campaign is engaging in this type of awful religious bigotry as a line of political attack, it is repulsive and, to put it bluntly, un-American. There is no excuse for these attacks."